Thank you to those of you who have asked about my work and/or about what happened to the old site.This new site will be an online gallery of paintings as well as a blog about the process that precedes the finished work. Thank you so much for looking. Each painting can be considered a search for a image that conveys some aspect of pure “wild Pacific Northwest-ness”. This search is sometimes about finding (and then painting) a river pool, or a tidepool scene, or a magnificent ancient red cedar trunk, or something else. Finding an image requires reading books, poring over maps, talking to rangers, exploratory hiking and backpacking, and more. It includes seeking new places but also return visits to found places, looking for new and different conditions in light and the evolving landscape. 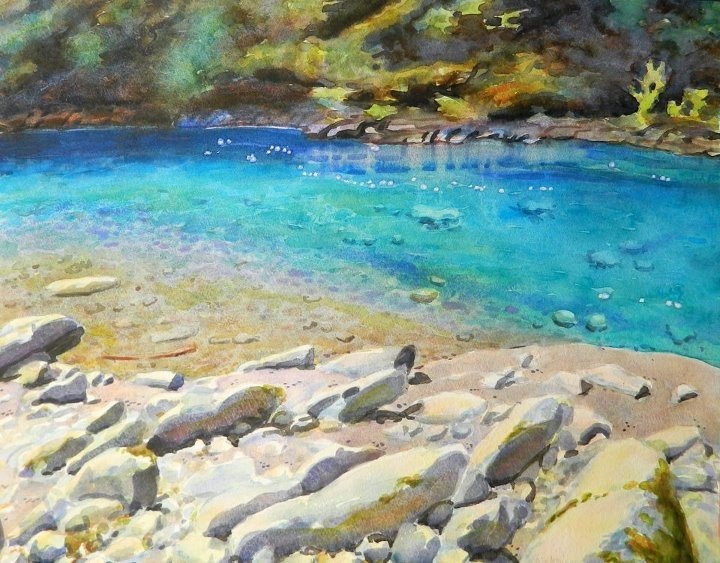 Then there are the observations, the plein air studies in paint, the sketches and the photographs, as well as the experience of the sounds, the smells, the taste of the water, the cold delight of the swimming hole, and all of that communing with nature. And then finally the working with the image back in the studio. Many of these efforts fail but none are wasted. When a painting actually works out, it is incredibly rewarding. And boy, is it all a lot of fun along the way.